Do you dream? : How Thick Is The Veil Between Being Aleep And Being Awake? How Thick Is The Veil Between Being Aleep And Being Awake? I’m in an unusual situation this week: No one has presented me with a dream to work on. So I have decided to use this Blog to examine the seeming difference between what goes on in our dreams at night and the events of “real” life that transpire during our days. Most people are convinced that the two experiences are completely different. My own research suggests exactly the opposite; I see very little difference between the two states. The argument usually given for demonstrating that there is a difference between dreaming and perceiving what goes on while we are awake, is that the images we have during sleep are often absurdist and illogical. The images of our awakened life, however, make reasonable sense. Our dream images can change and morph in the most irrational manner; our daytime images, on the other hand, are fixed and follow certain predicable laws and patterns. We can count on them and know pretty much what to expect. But is that really true? Yes, to a certain extent it is. For example, suppose I misplace my car keys and tear the house apart in an unsuccessful effort to find them. I am on the verge of missing a meeting I am supposed to drive to and feel frustrated. I give up, throw my hands in the air in a sign of surrender, and then, by chance, happen to glance on the floor by the refrigerator in the kitchen. And there, barely peeking out from under the kick plate on the fridge is my key ring. I let out an exclamation, grab my keys, and on my way to my car, remember that I had been putting away groceries and wanted to hurry to get the ice cream into the freezer before it melted. So I opened the freezer door before I put down my wallet and car keys. 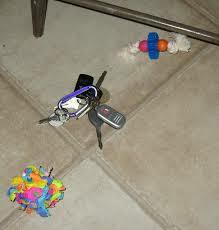 Obviously, I dropped my keys on the floor in the process, and that’s exactly where they stayed until I rediscovered them. That is so unlike a dream, say some people. In a dream, my keys might have ended up in the bathroom or hanging from a chandelier, or they might have transformed themselves into a bouquet of flowers. Any weird thing is possible in a dream. But in real life, it doesn’t work that way. As infuriating as it was not to know where my keys were, it was also totally reassuring to know that they stayed exactly where I had dropped them, and they remained in the same physical shape and form they have always maintained. For those who argue that there is a big difference between real life and dreaming, I acknowledge this much: The events of our awakened state are less fluid and usually more predictable than the plots and images of our nighttime dreams. But that’s as far as I’ll go. On Wednesday, I hope to demonstrate that there is, actually, more fluidity to our awakened lives than we usually acknowledge. Stay tuned!